Since the advent of the wood deck man has spent countless hours sanding, staining, and sealing each board to preserve the integrity of their construction and extend the life of their decks. But over the past decade, the introduction and improvement of composite decks in Reston, VA has made outdoor living so much easier. Composite decking is manufactured from wood byproducts and recycled plastics. Additives like pigments, preservatives, and anti-fungal treatments give the mixture the approximate color and texture of wood with injected protection against mold and rot that so commonly plague outdoor wood structures. 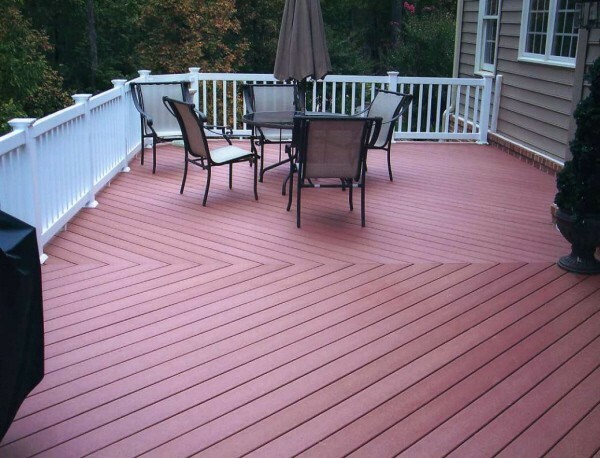 Composite deck materials are molded into two standard types of planks, hollow and solid. Both have their applications, but solid composite products are most popular today because they more closely resemble wood in appearance and strength, and are less susceptible to premature wear due to contraction and expansion with temperature fluctuation. There are several advantages these materials bring to composite decks in Reston. Composite boards are resistant to rot. They do not warp or splinter. And instead of back-breaking hours of painting, staining or sealing, all you have to do is keep pace with spills to avoid staining and wash your deck with soapy water twice a year. That’s it. Just like traditional wood decks, a composite deck platform is constructed over a structural frame of pressurized load-bearing lumber. And in most other aspects, a composite deck looks, feels, and performs just like any other deck. Except for that little maintenance issue. So make your outdoor living easy with composite decks in Reston, VA.